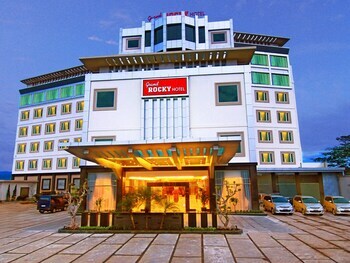 A stay at Grand Rocky Hotel places you in the heart of Bukittinggi, within a 15-minute walk of Jam Gadang and Taman Bundo Kanduang Park. Featured amenities include a business center, complimentary newspapers in the lobby, and dry cleaning/laundry services. Event facilities at this hotel consist of conference space and a meeting room. Free self parking is available onsite. With a stay at ZEN Rooms Denpasar Gelogor Carik 1 in Denpasar, you'll be within a 10-minute drive of BIMC Hospital and Siloam Hospitals. Free self parking is available onsite. With a stay at Airy Nagoya Raja Ali Batam in Batam, you'll be within a 10-minute drive of Harbor Bay Ferry Terminal and BCS Mall. Free self parking is available onsite.